The Osborne 1 was the original mass-market portable computer, and pioneered the "luggable" form-factor with the detachable keyboard forming a lid on one end of the machine. The Osborne shipped with a prodigious bundle of software that made the machine a terrific deal at the time. It was incredibly usable and fairly rugged (once the original Osborne 1 thin plastic case was replaced by a solid ABS case in the "Osborne 1a" version shown here). I've always had a soft spot for this machine. It's a really elegant design, though some criticize its tiny 5" monitor. The included version of CP/M could read a dozen diskette formats, which was really helpful. The Osborne 1 was replaced by the Osborne Executive in 1983. 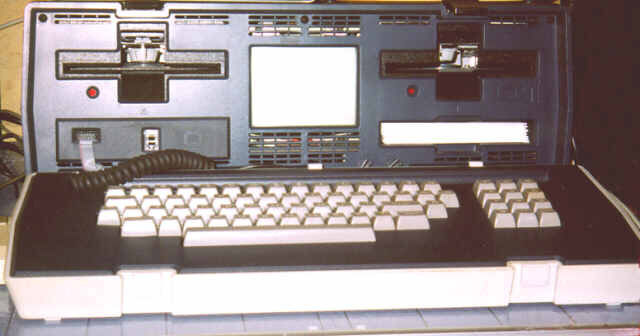 The Osborne 1's major competitor was the Kaypro 2, with a 9" display in a similar package.